The Brooks Banana Jack Test Ear provides improved safety and premium contact between your field test set and the terminals of front-connected test switches. 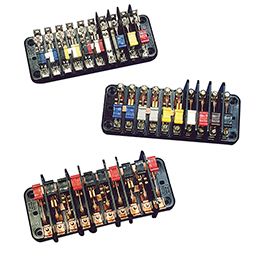 The Banana Jack kits enable field retrofit of ANSI C12.9 compliant front-connected test switches allowing for the use of banana plugs when connecting to the test switch. Brooks Compact Test Switches allow for simple, safe and consistent isolation of equipment for the purposes of testing, repair work or routine maintenance. Designed with the switchboard and protective relaying departments in mind, our compact test switches take up less space than conventional molded-base test switches. Our product offering provides complete flexibility with configurations ranging from 1 pole to 30 poles or any combination of currents and voltages. Further flexibility is delivered through the mounting methods and connections available: flush, semi-flush, front connected or back connected. The Mini-Compact Test Switch offers additional space savings with its smaller size. Each pole of a Mini-Compact Switch is appreciably shorter and narrower than a like and similar pole on a Compact Test Switch. Despite its smaller size, the Mini-Compact product is rated for the same service types and offers the same configuration flexibility found in the compact line of switches. Brooks designs and manufactures the finest quality and most complete line of test switches in the industry. Our Molded-Base Test Switches incorporate many features for safety, durability and reliability. All standard switch assemblies are rated at 30 amperers, 600 volts A.C. and meet all appllicable IEEE, EEI, Underwriter Laboratories and ANSI C12.9 standards. 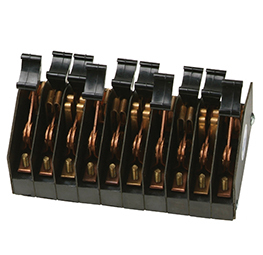 All switches are completely non-ferrous, manufactured from high conductivity copper and phosphor bronze. 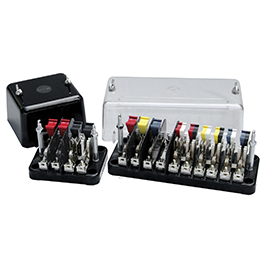 Test switches are furnished unplated and front-connected with red potential and black current handles as our standard offering. Contact Brooks for specific application needs. Reverse Potentials - Potential switch handles are mounted in reverse. In this arrangement the potential switches are de-energized when open, offering additional safety. Plating - Tin- and nickel-plating are available and provide additional protection for corrosive environments. Screw Terminals - Utilizing a captive pressure pad and box connector this option provides an easy and secure way to connect wires to front-connected switches. Simply add ST to the part number to add screw terminals. Color-Coded Handles - A wide array of colors (included two-piece/two-color) are available for customers to match the handle colors to their particular wire color codes. Back-Connected - Any Brooks test switch can be furnished in a back-connected arrangement with insulated bushings for panel mounting. 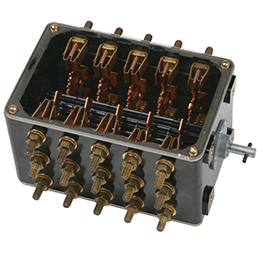 Custom Switches - In addition to the molded-base offering, Brooks also produces a variety of specialty switches for high voltage application, heel-and-toe switches for reactive metering and fused potential switches. Please consult your local Brooks representative for more information. Channel Barriers - Brooks offers channel barriers as an option for a permanent means of isolating potentials. 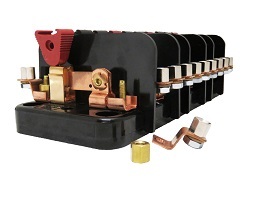 With the Roto test switch, relays and meters may be safely tested at the turn of a key without disconnecting the service. No live parts are exposed. The switch can be used for transfer of relays and meter circuits without removing wiring and is available in 4, 6, 10, 12, 14, 18 and 20 pole combinations. 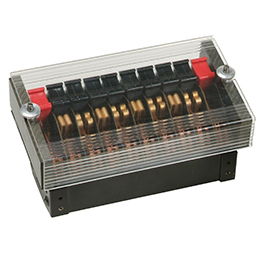 All Brooks test switches can be supplied with either a clear or black opaque plastic cover. Plastic covers are injection molded of Lexan which is a flame resistant, unbreakable UL Listed material. Captive Hardware is made from Acetal homopolymer. The new test switch barrier from Brooks allows easy installation of safety barriers to installed test switches in the field. Helps to separate voltage switches when adjacent to current switch or to another voltage switch at a different voltage. 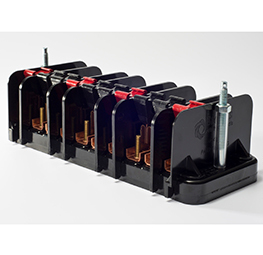 Conforms to ANSI C12.9 standards for test switches for transformer rated meters.